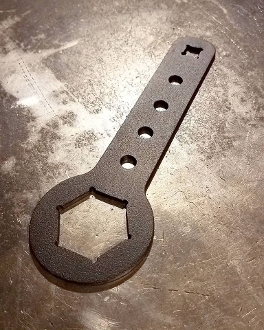 Zombie Performance Fork Cap Wrench! Fits all hydraulic front ends that have 1 3/8s inch (1.375in) fork caps. Small enought to fit in your tavel tool bag and strong enough to give you the leverage you need. Thin design allows you to remove or install the fork caps without having to remove the handlebars. 3/8s wratchet drive built into the end in case you need added leverage.